I can talk about sardines for hours and I'm glad to know that here are friendly ears! But, most of all, what I prefer is to taste them ! Found them on the net. Had a nice chat with the factory lady glad to meet Docsardino, the "man from the sardine museum" ! First of all, these are real sardines (sardina pilchardus walbaum), the only ones that really deserve the name of sardines. They're coming from Vendée, so they are different from the Britanians. Why? would you say, as Vendée is only a few miles distant from Britany ? They are sardines captured south of the Loire estuary. So they're feeding southly in the sands, when britanians are feeding northly in the rocks. Northern sardines have a more pronounced taste of seaweeds and are more muscular, southerns are younger (the place is cool for babies), a bit more fatty and smoother. 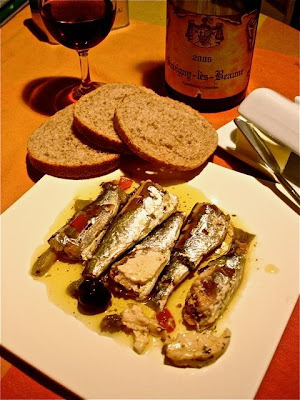 There is an ancestral hate between Vendeans and Britons, may be it's because of the sardines they eat ! There is only one sardine factory in Vendée, the cans are sold under different names but always bear The FR 85- factory code when most of Britanians bears the FR 29, FR 22 or FR 56 codes. FR 13 is the only mediterranean factory. Even if the sardines are disposed in the white way, opening the can doesn't give the nice shot I was waiting for. The sardine bellies are a little skinned, il could be better. But first of all it means that these sardines were fried and not steam cooked, and that's for the best. and most of all five on five for the super taste. There is a real surprising match between goat cheese, herbes de Provence and sardine. A must discovery ! This was fine with a glass of red Burgandy wine, a 2006 Savigny-les-Beaune to be precise, even if it would have been better with a white average dry Muscadet grown on the Loire banks. It is also to be noticed that once in a plate these sardines still look fine and appetizing. Next time, I'll test the smoked chorizo sardine can. And as I will be for a week vacation on the island of Noirmoutier in Vendée, I'll meet the lady, visit the factory and will probably bring back a whole truck of novelties ! Wow, thanks for dropping some serious sardine knowledge on us, Phillipe! Those do look delicious. 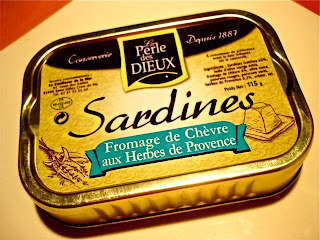 It is frustrating that French sardines are so difficult, nigh impossible, to find in the U.S. So the French actually "fry" the sardines in oil prior to packaging? That's quite interesting. 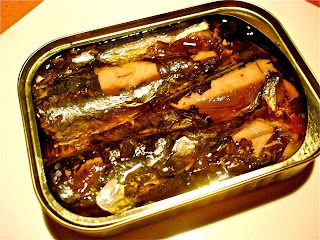 One other thing that you brought up that I've been wondering about for some time is this idea that seems to be popular in France that canned sardines in oil taste better with time. I was curious whether this idea really had merit and whether anyone on this blog had tested this theory. One tin with goat cheese and herb de Provence the other with chorizo!! Thank you for this incredible review. Bravo, Philippe. You know your tinned fish. Nice review. Yes,it's too bad that it seems there is no word in english for the french term of "confiserie". When Nicolas Appert invented the sardine can in 1810 (check for the bicentenial ceremonies in France !, no kidding), he was known as a "confiseur", one of his well known ancestor in the job was Nostradamus the fortune teller who was working on the way to preserve goods in sugar. The other reason is that a good canned sardine mustn't be too dry and only time can softened it. As a proof for all this, taste a filetted sardine in oil : it's absolutely tasteless : no bone = no taste. That's why it's often sold in sauce,just as mackerels ! So no good sardines before they're overaged, at least 4 years after it has been canned. Best with 8 years of cave, if you remember to turn them upside down every 6 months. I f I were to begin cellaring sardines, which would be a good tin to begin with? Best regards from "the" sardinologist !